Built on more a decade of basic neuroscience research at the Massachusetts Institute of Technology (MIT), scientists at Magceutics have developed a revolutionary compound Magtein — a superior form of magnesium — for maintaining and revitalizing essential brain functions. Results from preclinical studies demonstrated unprecedented efficacy of the compound for improvement of mental health. The functional performance, coupled with its exceptional safety, makes Magtein an important invention in the field of neuroscience and offers new solutions to today’s challenging cognitive health problems facing in aging population. To understand how Magtein works, we present in the following sections some simple description of brain biology, a glimpse of the molecular mechanism through which Magtein functions and some sample data. For more information, please check the references cited below and also visit Magceutics corporate website at www.magceutics.com. The human brain has roughly 100 billion neurons that communicate with one another through synaptic connections. Each neuron is capable of having thousands of synapses, leading to trillion of synaptic connections in the brain. The synaptic connections among neurons give rise to functional neural networks that form the underlying basis for higher cognitive functions such as learning, memory and emotional regulation. Studies have shown that synapse loss have dramatic negative effects on cognitive abilities and emotions. Aging and stress are both well known to trigger synapse loss. In the hippocampus, a brain region critical for memory function, aging leads to a decrease in synapse density, which causes cognitive decline. Figure 1. 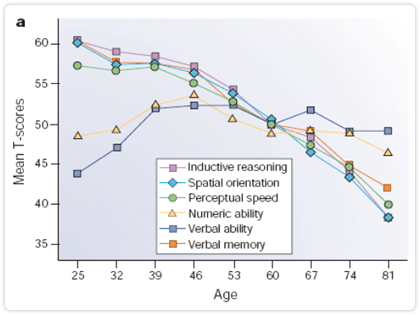 Left: Age-related declines in cognitive abilities, with the exception of preserved verbal and numeric ability. 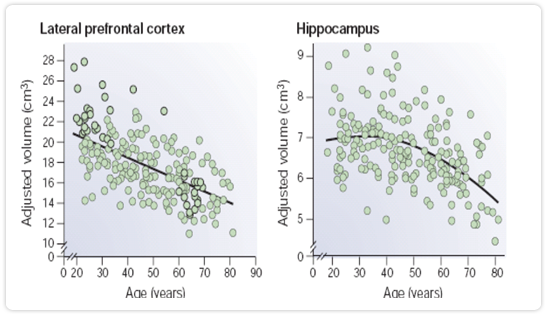 Right: Age-related atrophy in brain regions critical for executive functions and memory. From ref [1, 2]. Stress can also cause synapse loss in both the prefrontal cortex and hippocampus. Magnesium (Mg2+), the fourth most abundant mineral in the body and a cofactor for more than 300 enzymes, is essential to all living cells. A breakthrough discovery by a team at MIT demonstrated the key role that Mg2+ plays in regulating synapse density. The team showed that increasing Mg2+ levels in the brain leads to a significant and lasting increase in the number of functional synapses. His team then studied the behavior of lab animals that were given a magnesium supplement and found improvements to memory and cognitive ability . A key challenge in using magnesium to improve cognition is the difficulty in elevating magnesium levels in the brain. Mg2+ concentration is significantly higher in the brain than in blood. As a result, Mg2+ needs to be loaded into the brain via a specialized biologic process. Studies have confirmed that just ingesting conventional magnesium compounds fail to elevate brain Mg2+ [5, 6]. These results suggest that boosting brain Mg2+ via magnesium supplements can be very difficult, and that most forms of Mg2+ may not be suitable for elevating brain magnesium. To overcome this challenge, scientists at Magceutics developed Magtein, a proprietary magnesium based compound, which can significantly increase Mg2+ in the brain via simple oral ingestion. Magtein is the only commercially available magnesium based supplement that is specifically designed to increase brain magnesium levels. 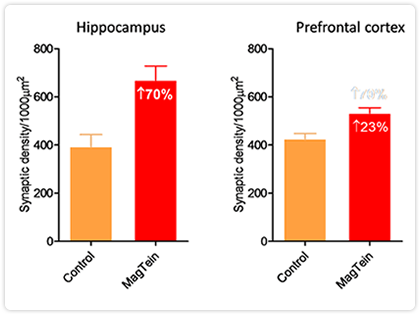 Preclinical studies demonstrate that Magtein supplementation leads to about a 70 % increase in synaptic density in the hippocampus and a 23 % increase in synaptic density in the prefrontal cortex. Figure 2. Increase in synapse density after Magtein supplementation. Adopted from refs [4, 7]. In young animals, Magtein supplementation enhanced memory function (Figure 3 left panel), while in aging animals, it completely reversed aging dependent memory decline. The memory function begin to improve 1 week after Magtein supplementation. Memory function return to baseline level 2 week after stopping supplementation. When supplementation was re-initiated, memory function was enhanced again (figure 3, right panel). These results were unique to Magtein and generic forms of magnesium failed to produce similar results. Figure 3. Left panel: Enhancement of short- and long-term memory after Magtein supplementation. Right panel: On/off kinetics of MagTein-induced spatial memory enhancement. Adopted from ref . It has been reported that nearly 70% of US adults fail to obtain adequate magnesium from their diets . In addition, daily stress can induce significant magnesium loss by reducing magnesium retention in the kidney . Besides a proper diet (food products rich in magnesium include whole grains, nuts, and green vegetables), Magtein supplementation is a good way for restoring brain magnesium to healthy levels. People taking Magtein have reported significant improvement in memory, sleep quality, and reduction of anxiety. Human clinical trials are underway to further explore the benefits of Magtein on brain function. Hedden, T. and J.D. Gabrieli, Insights into the ageing mind: a view from cognitive neuroscience. Nat Rev Neurosci, 2004. 5(2): p. 87-96. Schaie, K.W., Intellectual Development in Adulthood: The Seattle Longitudinal Study. 1996, Cambridge: Cambridge Univ. Press. Slutsky, I., et al., Enhancement of Synaptic Plasticity through Chronically Reduced Ca(2+) Flux during Uncorrelated Activity. Neuron, 2004. 44(5): p. 835-49. Slutsky, I., et al., Enhancement of Learning and Memory by Elevating Brain Magnesium. Neuron, 2010. 65(2): p. 165-177. Kim, Y.J., et al., The effects of plasma and brain magnesium concentrations on lidocaine-induced seizures in the rat. Anesth Analg, 1996. 83(6): p. 1223-8. McKee, J.A., et al., Analysis of the brain bioavailability of peripherally administered magnesium sulfate: A study in humans with acute brain injury undergoing prolonged induced hypermagnesemia. Crit Care Med, 2005. 33(3): p. 661-6. Abumaria, N., et al., Effects of elevation of brain magnesium on fear conditioning, fear extinction, and synaptic plasticity in the infralimbic prefrontal cortex and lateral amygdala. J Neurosci, 2011. 31(42): p. 14871-81. Li, W., et al., Reversing cognitive deficits and synaptic loss in Alzheimer's mouse model by elevating brain magnesium. J Neurosci, 2013. 33(19): p8423-41. Ford, E.S. and A.H. Mokdad, Dietary magnesium intake in a national sample of US adults. J Nutr, 2003. 133(9): p. 2879-82. Grases, G., et al., Anxiety and stress among science students. Study of calcium and magnesium alterations. Magnes Res, 2006. 19(2): p. 102-6.